I finally got my paws on a bag of Pumpkin Dandies Marshmallows over the weekend. I saw them online last year and this year but never found them in store till I was in Whole Foods (Arden - Sacramento) last Saturday. My mistake was I bought one bag - I should have bought more! Hopefully I can get a few more bags because these lil fluffy sweet morsels are divine! First up I made Matt and I each a cup of cashew milk hot cocoa topped with a fistful of Dandies - yum! It was the perfect end of the day treat. The pumpkin flavor blended well into the dark chocolate coco I served up. it was like having a coffee house treat at home. As I was making the cocoa Mady had to sample them and was purring with happiness. I made crispy treats yesterday with them. The mini marshmallows melted perfectly (in the past the bigger sizes tended not to melt fast enough unless I cut them down into thirds). The marshmallows made the brown rice cereal I used taste like fall. Perfect! I paired a treat with a cup of tea and I was in heaven! These are so tasty! They make pumpkin spice special. Dandies vegan marshmallows are the best thing since sliced bread! They have the ability to bring back memories and create new ones! 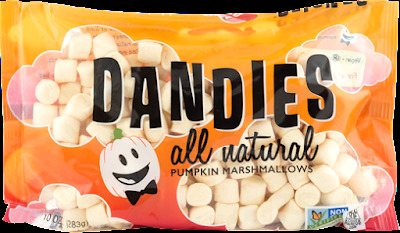 I'm such a fool, I spotted these at Whole Foods in NYC and I didn't grab a bag and then I straight up forgot to get any Dandies at all on my trip!